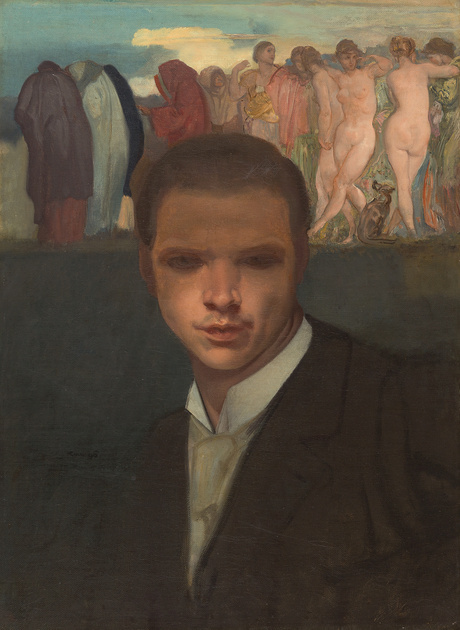 Jettmar’s Self-Portrait (1896) was in his estate (Nachlass) upon his death, from which it passed to his son the noted anthropologist Karl Jettmar (1918-2002) and then within the family in Baden-Württemberg until its sale at Karl & Faber Kunstauktionen, Munich, on June 5, 2014 (Auction 256, Lot 522). 1975 Rudolf Jettmar (Regensburg: Ostdeutsche Galerie, 1975), cat no.23, illustrated on catalogue cover and at p.44. 1984 Hans H. Hofstätter, Rudolf Jettmar (Vienna: Tusch, 1984), illustrated at p. 57; the catalogue raisonne. 1992 Annalia Delneri, et al., Simbolismo Secessione -- Jettmar ai confine dell’Impero, (Gorizia: Castello di Gorizia, 1992), illustrated at p. 31. 2000 Ingrid Ehrhardt and Simon Reynolds, eds., SeelenReich – Die Entwicklung des deutschen Symbolismus 1870-1920 (Munich, London, and New York: Prestel, 2000), cat. no. 159, illustrated in catalogue at p. 273. English edition: Kingdom of the Soul – Symbolist Art in Germany 1870-1920. 2013 Dekadenz – Positionen des österreichischen Symbolismus (Vienna: Belvedere, 2013), illustrated in catalogue at p. 57 and p.159. English edition: Decadence – Aspects of Austrian Symbolism. "His self-portrait is thoroughly influenced by the tradition of academic historicism, but goes beyond that and shows a very intimate image of his artistic and personal nature. The image can be captured in three levels: the front level, which shows the artist in his physical presence, the back level, which represents his intellectual creativity, and a third level, which results from a horizontal division of the background. This third level, completely dipped in black, symbolizes the dark soul of the artist. It is interesting how he presents this division not only in composition but also in the use of light. So his face in the lower area, especially around the mouth, is illuminated, but his eyes and forehead are in the dark and moved back into the background. An indication of this worldly and otherworldliness can be found in the image frieze depicting the ages and the passing of beauty and life. 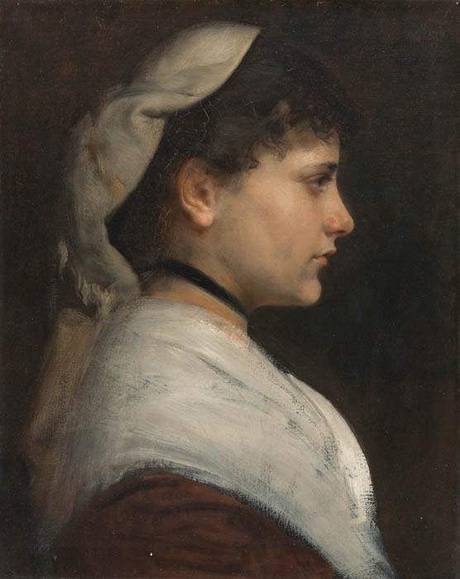 An incredibly exciting, impressive and symbolically charged portrait of a doubt-filled artist." 1984 Hans H. Hofstätter, Rudolf Jettmar (Vienna: Tusch, 1984), Ö75; the catalogue raisonne. 1984 Hans H. Hofstätter, Rudolf Jettmar (Vienna: Tusch, 1984), Ö8; the catalogue raisonne.